Facing a bet on the river, Jean Robert Bellande folds A-K face up even though he says it's probably the best hand. Bellande missed the board entirely, so his ace-high hand can only beat a bluff. Brandon Cantu (right) stops by the rail on Day 5 of the WSOP Main Event. 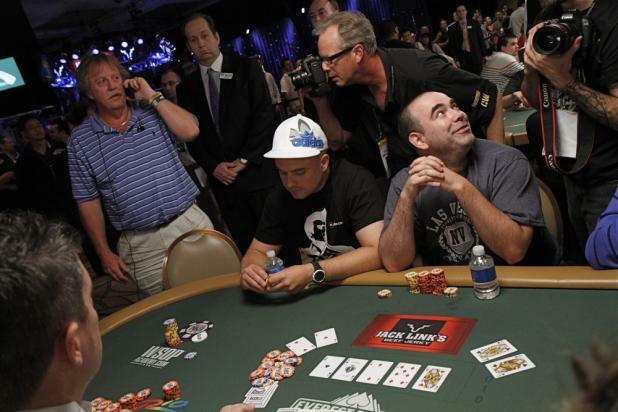 The Mizrachi family has been one of the big stories of the 2010 World Series of Poker. 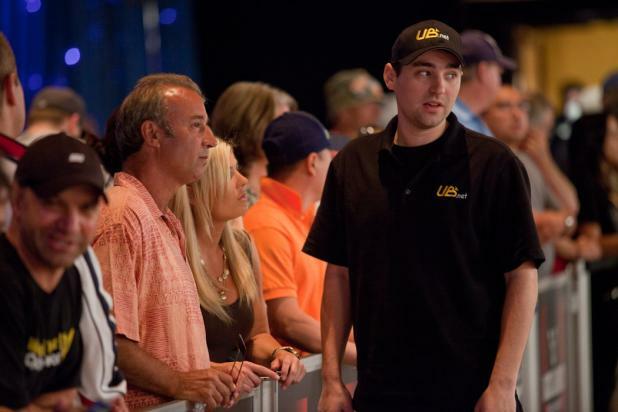 It started in the first open event, with brothers Michael and Robert final tabling the $50,000 Poker Players Championship -- Robert finished fifth, and Michael won it. Both brothers would go on to reach two more WSOP final tables each, and both would enter the Main Event in the top 22 of the WSOP Player of the Year rankings. But then, as if to put an exclamation mark on the Series, all four Mizrachi brothers (Michael, Robert, Eric, and Danny) cashed in the WSOP Main Event -- the largest number of siblings to ever cash in the same WSOP event. 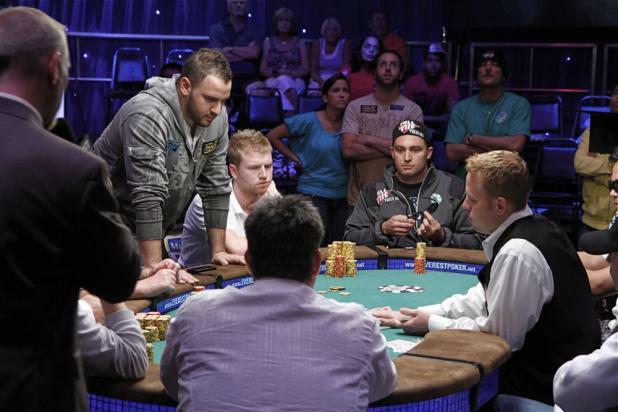 In this photo, Michael Mizrachi (left) watches the board as he is all in preflop with pocket tens (10-10) against another player's pocket sevens (7-7). Michael's wife Lily and his fraternal twin brother Eric (center) watch from the stands. 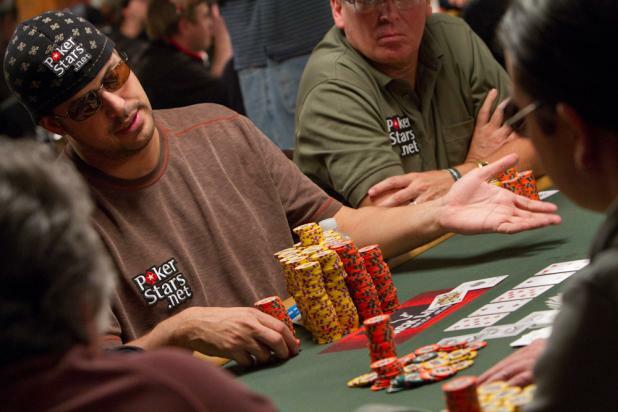 The WSOP Player of the Year race isn't very close in 2010, as only five players began the Main Event with a chance of catching Frank Kassela (right), and they'd all need to reach at least third place in a field of 7,319 players. 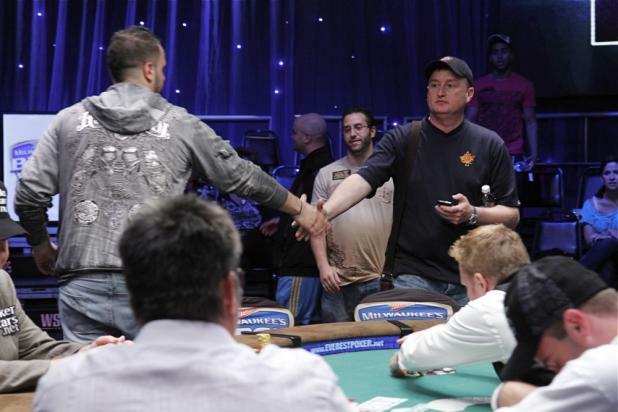 When the money bubble burst, Michael "The Grinder" Mizrachi (left) was the only contender still alive. Once Kassela reached the money (earning 5 POY points), he was guaranteed at least a tie for Player of the Year. Shortly after the bubble burst, Kassela was all in preflop with pocket kings (K-K) against pocket queens (Q-Q) and A-Q. But the case queen hit the flop, and Kassela had the second-best hand behind a set. Then, runner-runner spades gave the third player a flush to win the entire pot -- Kassela was eliminated with the third-best hand. With Kassela's elimination, the fate of the POY race is now in Mizrachi's hands, but anything less than a victory in the Main Event will give the award to Frank Kassela. Once it was determined that nobody but Tim McDonald busted on that hand, he was taken to the small stage in the Amazon Room to stand with Tournament Director Jack Effel. Effel said, "Because of you, Tim, 747 players are now all in the money. You, my friend, have an automatic $10,000 entry into the 2011 WSOP Main Event on behalf of the World Series of Poker." After a flop of A-A-2 rainbow, Tim McDonald (standing, left) gets all his chips in the middle with pocket queens (Q-Q), only to see his opponent turn over A-2 for a flopped full house, aces full of deuces. McDonald would need a runner-runner miracle to stay alive (nearly a 1,000-to-1 shot), but the 7 on the turn clinched his fate. A queen fell on the river to add insult to injury -- McDonald lost the hand with a lower full house (queens full of aces). 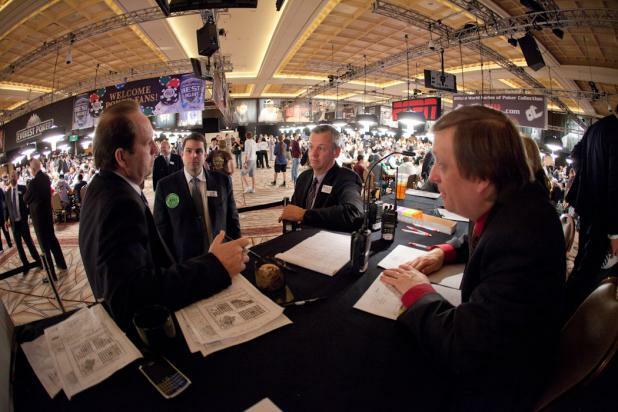 During hand-for-hand play on the money bubble, ESPN's cameras rush to every table where a dealer yells, "All in and a call!" In the story of the tournament, the hand that bursts the money bubble is a key part of the story, and ESPN definitely wants to feature it in their coverage. 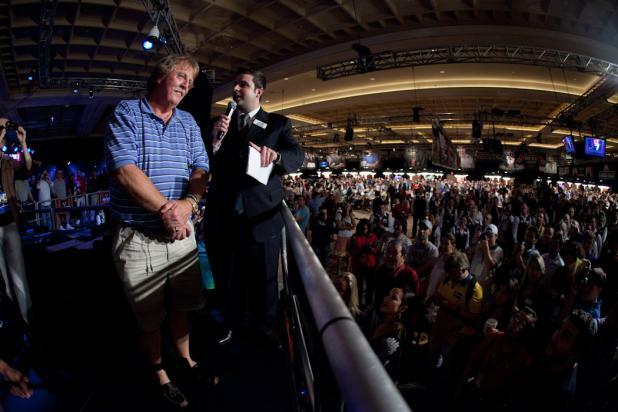 The field plays hand-for-hand on the money bubble on Day 4 of the WSOP Main Event. 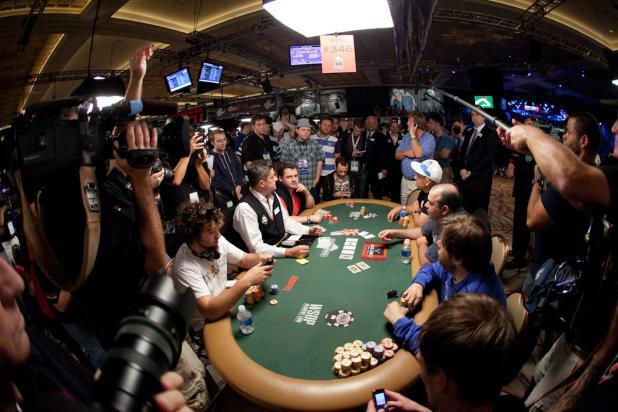 Whenever action finishes at a table, the dealer stands up to indicate that his or her table is ready for the next hand. WSOP Tournament Director Jack Effel then scans the field for hands that are still in action (with seated dealers). 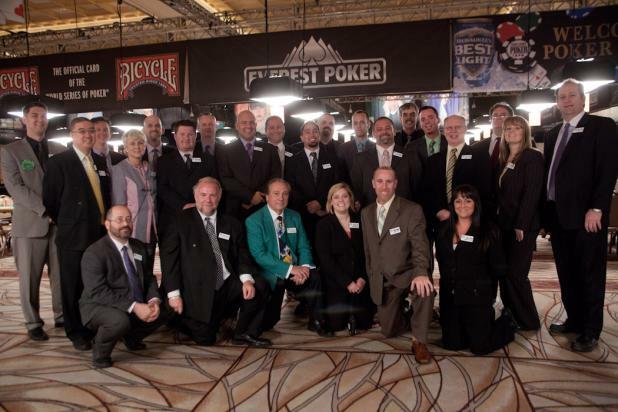 During the dinner break on Day 4 of the WSOP Main Event, 25 members of the WSOP staff pose for a group photo. 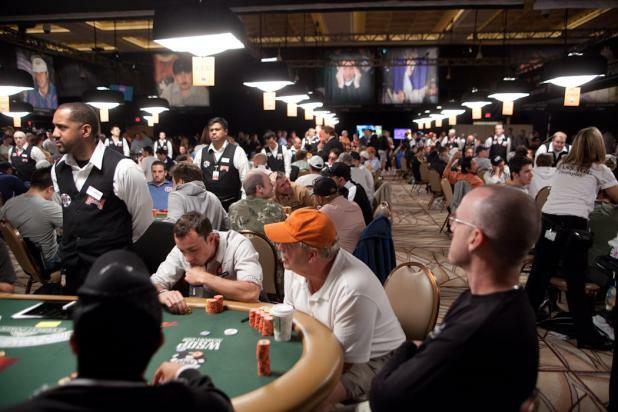 The money bubble was reached about 10 minutes before the dinner break on Day 4 of the WSOP Main Event. The WSOP staff had some quick discussions and decided to send the players to dinner before starting hand-for-hand play. There's no telling how long hand-for-hand play will last, and the break would allow the staff extra time to prepare for the chaos of the money bubble.